The First MakerBot Innovation Center Opens in the Western U.S.
We’re celebrating an exciting new chapter for MakerBot. After expanding our level of sales support and training on the West Coast in August, we’ve successfully installed Arizona’s first MakerBot Innovation Center. This month, Northern Arizona University opened the doors to its Innovation Center, a new cornerstone for the Cline Library MakerLab. As the third ever Innovation Center to be hosted in a library, NAU builds on a growing trend of improving access to 3D printers by making them available to the greater academic community, rather than a single department or research lab. By doing so, libraries are evolving to fit the needs of the digital age and transforming their spaces into technologically advanced learning hubs. 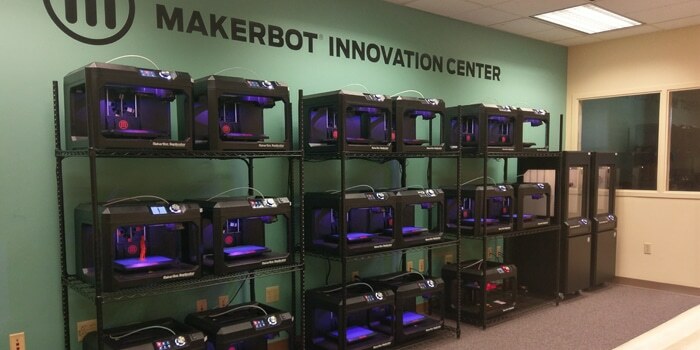 Designed to elevate learning and promote cross-departmental collaboration, the MakerBot Innovation Center is set to give NAU students access to real-world design and iterative development. “The philosophy behind the MakerLab, and maker culture, is that anyone can solve a problem, anyone can be an inventor or artist,” said Janet Crum, Head of Library Technology Services for Cline Library. “We hope the MakerLab will help people use their creativity in new and exciting ways to make their lives and our community better.” Cline’s MakerLab is open to students, faculty, and staff at NAU and Coconino Community College, as well as the wider community in the region. In addition to the MakerBot Innovation Center, which includes 20 industry-leading 3D printers and 3D scanners, NAU’s new lab contains tools like Raspberry Pis and Arduinos that enable students to build and prototype their own electronic devices. “Their library is the perfect location to provide access and 3D design and printing literacy to all. It brings together the community and students by using MakerBot as the bridge – we’re eager to see all of the groundbreaking collaborations and applications that come out of this space,” said Wallace Patterson, Global Director of Educational Enterprise Sales at MakerBot. As an exciting hub for STEAM exploration, the NAU MakerBot Innovation Center will provide students with the tools they need to act upon ideas and shape the future of their communities. Discover how you could inspire teachers, empower students, and elevate access to 3D printing at your university with a MakerBot Innovation Center!